When one hears the word “passion,” one usually thinks of romance, of people so in love they can’t keep their hands off each other. For me, the word took on a different meaning a few years ago when I was in the midst of a huge life change. “Passion” for me meant to be so in love with what I was doing in my life that I looked forward to waking up every morning and getting the day started. “Passion” became my personal key word. I’ve discovered that when you are surrounded by people who share a passion, you are never alone. I was able to experience this in a different way at the Norman Mailer Society Conference in Provincetown, Massachusetts the first weekend in October. I am not a Mailer scholar. I’m familiar with his works and his legacy, but I’ve never studied him closely. I was invited because the Wilkes Readers Theatre Group needed more female readers for the marathon reading of Mailer’s Tough Guys Don’t Dance. I jumped at the chance, having no idea what a staged reading was and not having read the book. The Wilkes Creative Writing program had been reading at every Mailer conference since the Society first read in P’town, and Mailer was the program’s first Advisory Board member; hence the connection. Closer to the date I started to panic a little—what if I had to act, and worse, act in front of people? But no, it was just as it sounded. I would play a few minor roles in the book and read those character’s lines out loud and, in return, I could enjoy the panels at the conference and P’town itself. Riding into Provincetown on Wednesday night, I was afforded none of the stunning views of the ocean or bay that others enjoy when they descend onto the Cape. I eagerly stuck my head between the driver and passenger, but only saw the wet swipes of the wipers and the lights of the places we passed. So be it—just being there was a treat, and I looked forward to everything about this weekend—the reading I was involved in, meeting others in the Society, spending a few nights on the bayside of the town in a creaky, leaky inn room with thin walls. Stepping into the inn’s bar later that evening, I assumed the majority of the men and women milling about were there for another event. My assumption was proved wrong quickly when I noticed almost everyone had the same name tag hanging from their necks, and I realized we were all there for the conference. Familiar faces dotted the crowd—Dr. Lennon, Ross Klavan, Ken Vose, and, of course, the Wilkes people I had come with: Dr. Culver, Bill Schneider, and Jan Quackenbush. Soon I would run into others from the program—Carol Lavalle, Richard Preibe, Nicole DePolo, Matthew Hinton, Patricia Florio, and Shawn Hattan. At the same time, however, I was fascinated at meeting others involved in the society and learning where their interests in Mailer lay. Thursday and Friday were busy because our staged readings were taking place over these two days. Directed by Ken Vose, the novel’s main character was given life, read by (in order of the readings) by Ross Klavan, Matthew Hinton, and John Buffalo Mailer. The readings were marathons—each taking at least three or four hours—and were split into three sessions. The first was filmed at the Provincetown Inn, the second at the Pilgrim Monument and Provincetown Museum, and the last at the Provincetown Public Library. On Thursday, after our morning reading, Interim Associate Director Bill Schneider took me into the town—he lived there previously for ten years—to show me the hot spots. Pulling up to Norman Mailer’s former home, we noticed the “for sale” sign was still up—although designer Diane von Furstenberg’s daughter, Tatiana, had purchased it earlier in the summer. Surrounded by hedges, the house is well hidden so when Bill and I stepped up to take a few photos, we were astounded to see th e front door was wide open—and we could see Cape Cod Bay out the window on the wall opposite the door! Renovations were still taking place at the time, and a workman simply nodded at us as we gaped from the front steps. We didn’t go any further, but I’ll be honest—I wish I had stepped into the home. The weight of its history pressed on my mind and I imagined Mailer and his family running in and out of the house, enjoying holidays and the off-season. We later drove to the cemetery where Norman and Norris Church Mailer are buried, and it felt full-circle to me. That this titan of literature found solace on this thin strip of land—and now resides there forever—makes the place special. That the Society returned this year for the conference was bittersweet. The conference itself took place Thursday through Saturday, and was filled with various panels and presentations. Richard Priebe, Wilkes alum, presented his piece, “The Evolution of Mailer’s God,” while Wilkes alum Nicole DePolo presented hers, “’The Turd’: Norman Mailer and the Pollution of Language.” While I was busy in the staged reading as these papers were presented, I was able to chat with Richard and Nicole at different times throughout the weekend, and I was reminded of my own love—passion, if you will—of writing critical analysis papers. Everywhere I went during the conference’s three days, I found myself talking to other Society members, fascinated and captivated by Mailer’s work. I was finished with the last reading on Friday fairly early, as my role only had a few lines in the first chapter of that session. 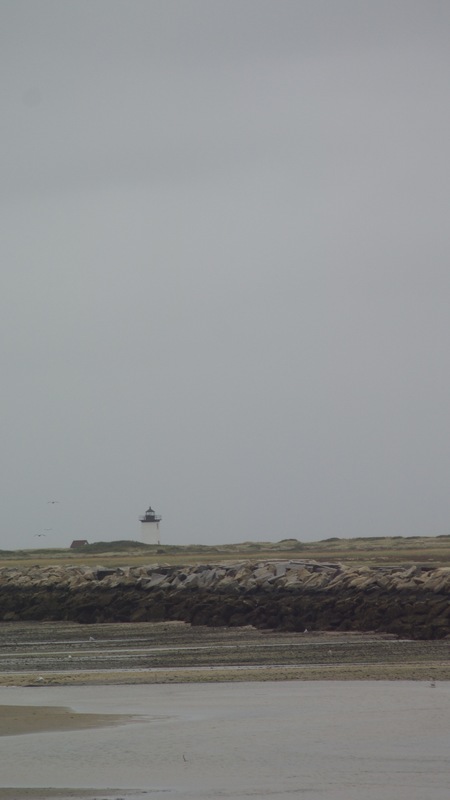 I took the opportunity to explore Provincetown on my own—in the pouring rain, I might add—so there was hardly another soul out on the streets. Traipsing down Commercial Street, I passed a sign for Coastline Tattoo and redirected my steps to their small studio in an alley. After speaking to the receptionist for a few minutes and paging through some books, I scheduled an appointment for the following afternoon—at 3 p.m. The tattoo didn’t take long—less than half an hour—to get. I’d had the idea for a few years, but hadn’t done it. I’m glad I waited, as the finished product is exactly what I wanted and getting it in Provincetown over this special weekend makes it more meaningful. It’s simple—the word “passion” in American Typewriter font—with a watercolor smear of five colors in the background, on my left wrist. It’s not just my own passion I’m celebrating with this tattoo, but the passion of others. The untapped excitement with which we approach a creative project, the feeling we get when we hit on that creative sweet spot, or even just the reminder that that well of passion still resides within. On the dark days, the rainy days, the days I struggle to see the reason to get out of bed, I have a little reminder always by my side that the passion may be stilled within me, but it is nevertheless there. Just as the passion to keep Norman Mailer’s name and legacy in the forefront of American literature spurs the Norman Mailer Society to continue their work with yearly conferences like this one. They may not make it back to Provincetown for a few years, but the heart of the Society resides there, just as Mailer himself still does. Dal e Louise Mervine has worn many hats: gas station attendant, group sales cashier, typesetter, marketing and research coordinator, teacher, photography assistant, delivery person, office decorator, and [unwilling] salesperson. She currently owns her own business but isn’t exactly sure what to do with it. She lives in York, PA, with eight cats (yes, EIGHT), and her pet skunk (yes, he’s descented). This entry was posted on December 18, 2015 at 10:02 pm and is filed under Uncategorized. You can follow any responses to this entry through the RSS 2.0 feed. You can leave a response, or trackback from your own site.